Full color photos bring concepts to life and emphasize the role of the vet tech. 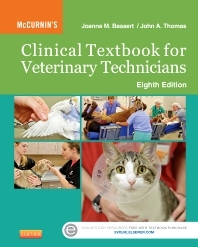 Vet Tech Threads offer helpful pedagogical aids such as introductions, suggested readings, boxed Technician Notes, learning objectives, chapter outlines and key terms. Large animal care integrated throughout the book with medical records, dentistry, physical examination, surgical instrumentation, and more. Step-by-step instructions and photographs makes information readily accessible in emergency and clinical situations. A companion workbook is available separately to help you master and apply key concepts and procedures with multiple choice questions, matching exercises, photo quizzes, labeling exercises, crossword puzzles, and more. "You'll find all you need to master to work with animials, from capture and restraint of swine to calculation of RBC indices. This is really a very thorough work. Recommended readings are listed at the end of the chapters and eye catching 'technican notes' help the reader focus on key points."